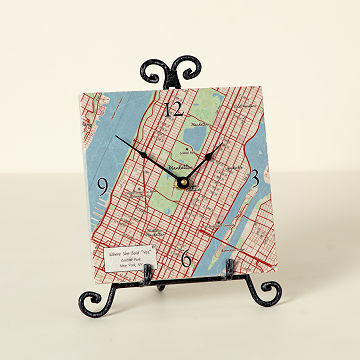 Celebrate your hometown, old stomping grounds, or your newest neighborhood with this custom clock. Celebrate your hometown, old stomping grounds, or your newest neighborhood with this custom clock. Featuring nine square miles of your chosen locale, this marble timepiece marks your specific location with a small compass rose. This clock is perfect for the home office or boat cabin, and can be placed on a desk or hung on a wall. Made in Providence, Rhode Island. Clean stone with a damp cloth. Handle with care. Clock can be mounted on the wall or displayed on the easel (included). Being able to customize it makes it a great gift that the newly weds will cherish. VERY EASY TO LOOK AT. I will give the clock to them for Christmas and I expect that they will love it. I try to get them something every year that is "unusual ". I bought this as a gift and they raved about it! I bought this as a housewarming gift. They really appreciated it and loved the way it turned out! They exclaimed about the high quality. Perfect gift for new home owners. Perfect for map fanatics, new home owners and a lovely, personal wedding gift. What an amazing idea...and the craftsmanship is wonderful. Beautiful design, nice finishes and great weight. This is a wonderfully unique gift that's also practical. The personalization makes it an extremely thoughtful gift idea. Love it!